7.1 billion-transistor Kepler chip is incredible, but will we see it on the desktop? I hate to say I told you so. But Nvidia has taken the wraps off a new high end graphics chip, currently known nattily as GK110. It's the biggest, baddest member of Nvidia's Kepler architecture, which powers graphics cards like the Nvidia GeForce GTX 680. And it leaves me with no choice but to say, well, I told you so. The context here is my recent whingefest regarding the dual-GPU Nvidia GeForce GTX 690. My argument was that the chips inside the premium priced GTX 680 and 690 boards were midrangers that serendipitously turned out to be faster than high end efforts from the competition - read AMD. The real high end Kepler had yet to be seen. Nvidia has now come clean and GK110 is every bit as magisterial as I'd hoped. The specs aren't completely finalised, but here are some highlights as they currently stand. We're talking about a 7.1 billion transistor chip with up to 2,880 CUDA cores, 240 texture units and 48 ROPs. It's a beast. For the record, that 7.1 billion transistor figure is big enough to enable Nvidia to claim GK110 to be the most complex single computer chip in Christendom. Roughly speaking, it allows for slightly less than a doubling of many of the key functional units compared with the GK104 chip found in the GTX 680. Lest you forget, currently GK104 is comfortably the fastest single graphics chip on the planet. Fair to assume, then, that GK110 would be an incredible graphics chip for games and one that would utterly annihilate AMD's top Tahiti GPU, as found in the Radeon HD 7970. But will PC users ever get the chance to experience it? That's the critical question following GK110's outing at Nvidia's GPU Technology Conference a few days ago. For now, Nvidia has only announced one product that will use GK110. And it's not a graphics card. Instead, it's part of Nvidia's heavy metal Tesla family, which are effectively co-processors designed to crunch heavily parallelised work loads. Think computational chemistry, bio-informatics, oil and gas surveying, financial modelling, that sort of thing. Now, it's absolutely true that Nvidia has a track record for rolling out new GPUs in Tesla form first. But things are clearly a bit different for Kepler. 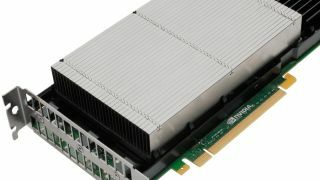 For starters, Nvidia is marketing and branding the existing GeForce GTX 680 and 690 as its top-of-the-line graphics cards. In really simple terms, there's not much space left in the GeForce 600 Series nomenclature for a new uber GPU. That's unlikely to be accidental and ties in with the realities of the hardware side of GK110. For starters, it's so big and so complex, it may not be suitable for desktop PCs. Moreover, Nvidia has loaded it with features that are very desirable for Tesla applications, like high performance double precision processing and ECC cache memory protection, but are pretty much pointless for graphics. It's an odd situation because, as far as I can tell, GK110 remains first and foremost a graphics chip. But it's not clear if it will ever be used as one. Of course there may be some uncertainty on Nvidia's behalf. We're clearly in a transitional phase when it comes to all manner of computing architectures as CPUs and GPUs converge. Perhaps GK110 is a stepping stone to future Tesla chips with the redundant graphics hardware stripped out. Whatever, I'd personally love to see Nvidia strap some graphics memory and a DVI port to GK110 and let us see just what it'll do. These may be the dying days of the conventional performance PC. But it would be a minor tragedy if this monumental piece of silicon mastery never got a crack at what it was primarily designed to do – making games look better than ever before.